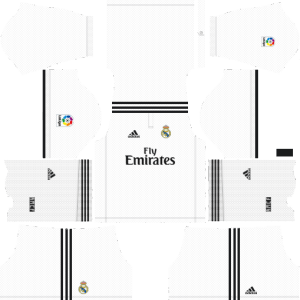 In this article, you can find and download Dream League Soccer Real Madrid 512×512 Kits and Logos 2018, 2019 Edition with URLs. In DLS (Dream League Soccer) game every person surely will be looking for Real Madrid logo and kits because as we know it is one of the biggest soccer clubs with good talented players. So I think DLS game lovers might be looking for Real Madrid logos and kits. Below you can get all the working kits of Real Madrid with URL to download directly into your game. 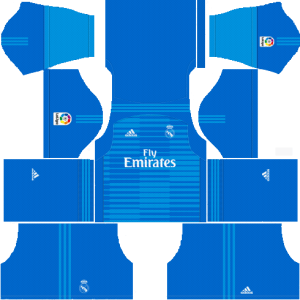 Real Madrid is a very popular team and many fans want to play with RM kits and logo. We are presenting you the exclusive kits and logo for the 2018-19 season. The package contains home, away and goalkeeper kits and you can use it in your team to play with them. The kits are in the size of 512×512. The Real Madrid home kit is the traditional white color kit with few black stripes. The kit also consists of the sponsors’ logo which is the Fly Emirates and Adidas. 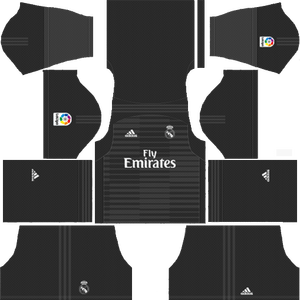 The away kit of Real Madrid is full black and consists grey color stripes in bits and pieces. There is also La Liga stamp on the sleeves portion of the kit. 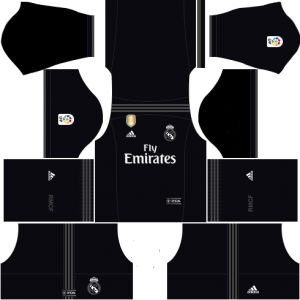 Real Madrid gk home kit resembles exactly like the RM away kit but if you focus, you will find minute differences between them. The kit consists of 2 or 3 patterns with different shapes over the whole kit. In terms of pattern, the kit is same as the RM gk home kit. The only difference is the color of the kit. You can use this attractive kit in your DLS 2018 team. Real Madrid logo has changed over the years to minute different shapes and patterns. This year’s logo is circular in shape with the king’s crown on the top of it. Above we provided all logos and kits of Real Madrid so you need more then comment below or if you want other logos don’t worry we are ready to make for you.so drop your logo or kit name in the comment section. we will make within a week and post on this website.so try to follow this we get Real Madrid logo 2018 – 2019 updated stuff. To use Real Madrid Kits/Logos, open your Game in Android or IOS. I expect the Real Madrid kits & logo URLs for DLS game are working perfectly fine for you guys. In case any errors please let me know through comments.